To kick off the 2018 holiday shopping season, Coresight Research is featuring daily profiles of 10 innovative companies that span health and wellness; apparel, footwear and accessories; and, beauty. Each of our Ten Days of Holiday Innovators profiles gives you a company overview, insight into what makes the company innovative and the company’s recommended “must-have” gift for 2018. 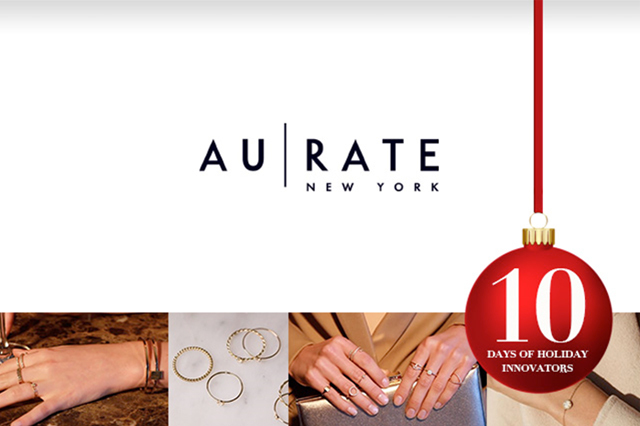 In the fifth report in our Ten Days of Holiday Innovators series, we look at AUrate New York. AUrate is a New York-based, handcrafted fine jewelry brand founded in 2014 by Bouchra Ezzahraoui and Sophie Kahn. The company launched as a direct-to-consumer fine jewelry brand that “checks all of the boxes,” focusing on designing high-quality fine jewelry, made with ethically sourced, sustainable materials at fair pricing. Today, the company operates as a fine jewelry, direct-to-consumer brand plus five stores. The cofounders, formerly businesswomen at Goldman Sachs and Marc Jacobs, said that they saw a white space in the “middle” of the jewelry market for the millennial woman, like themselves, who were buying quality jewelry pieces and building their own collections (and not waiting for someone else to buy it for them). The company offers Curate, a try at home service, for consumers to try up to five fine jewelry pieces free before deciding on a purchase.